We have been long in returning but we have not been idle since Update 54. We, of the Ballinafad Oral history Project of the N.H.C.H.S., have been working intensely with Graeme Morton, Chair, Department of Scottish studies, University of Guelph and James Jensen, doctorate fellow and teaching assistant to create a university website specific to the Oral History project. This site and samples of the interviews done with pioneer descendants will be available on www.electric scotland.com as well. 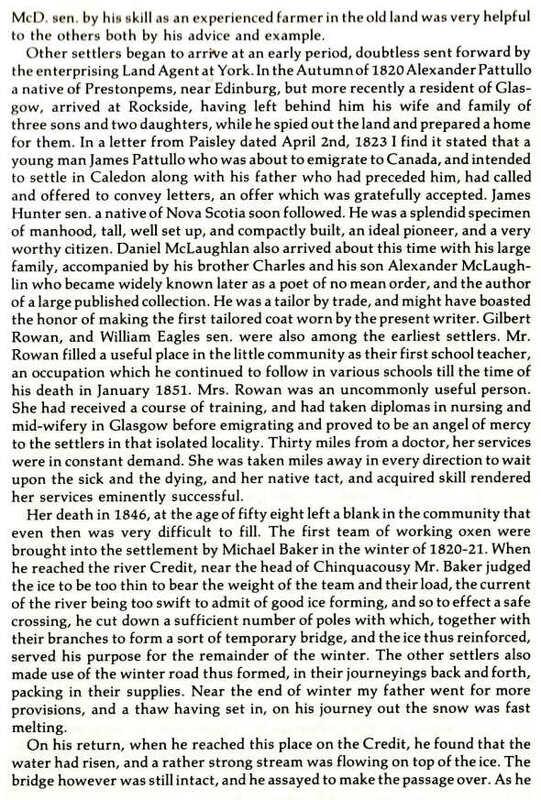 In Update 54, we introduced you to the Rockside Pioneers who first pioneered the region of Caledon by introducing you to Robert Crichton’s wonderful book. In reply to my query, Jim Kirkwood, great grandson of Donald McKay of Fallbrook and son of James P. Kirkwood of Ballinafad wrote ``yes, Wm Kirkwood, my grandfather married Mary McKay, she was born 1871; don't have the year of marriage, but their first child Oliver was born 1896. 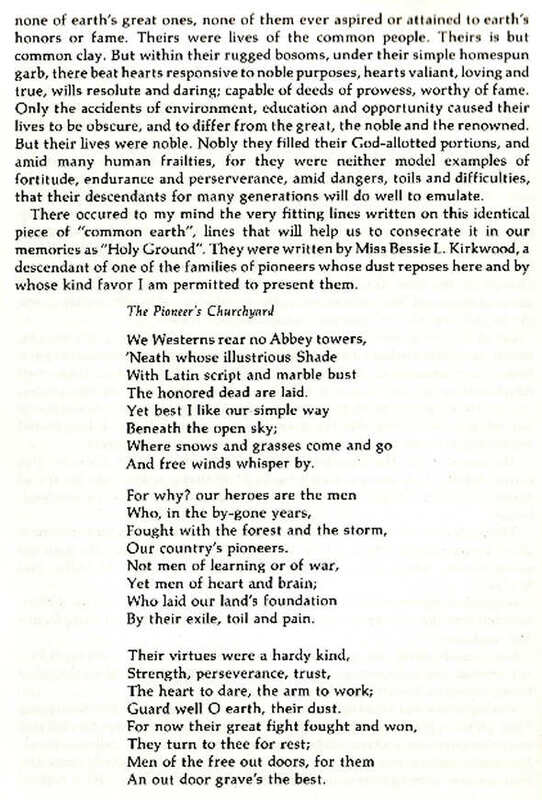 Yes Wm Kirkwood was definitely an ancestor of mine. 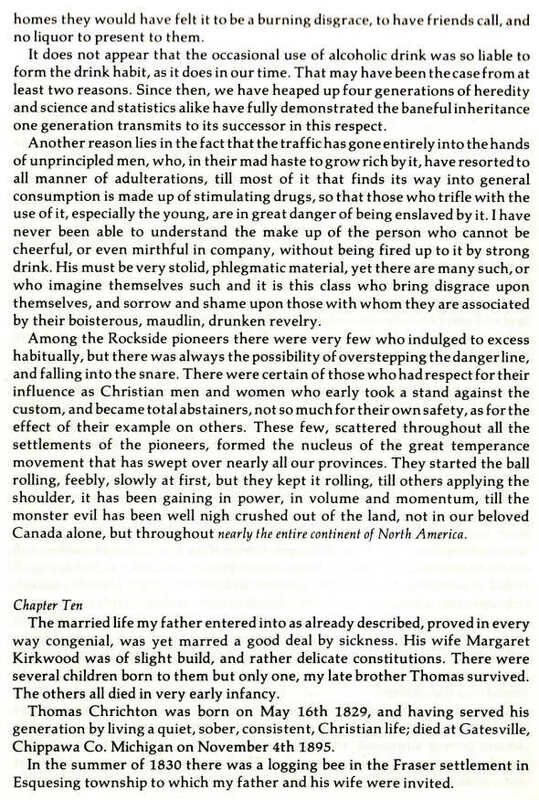 In April, 2008, the Kirkwood’s took the author of these lines on a tour of our rockside and ballinafad roots. Alan K. served as guide and described in detail the different farms, lots and pioneer highlights. On the left, Alan, Jim and Marion Smeaton Kirkwood visit the burial plots of their rockside ancestors. Below right, Marion S. Kirkwood is seen with Marion Kirkwood, life partner of Jim Kirkwood. Below left, Marion S. Stands beside a monument at the heritage Providence Cemetery in Ballinafad. 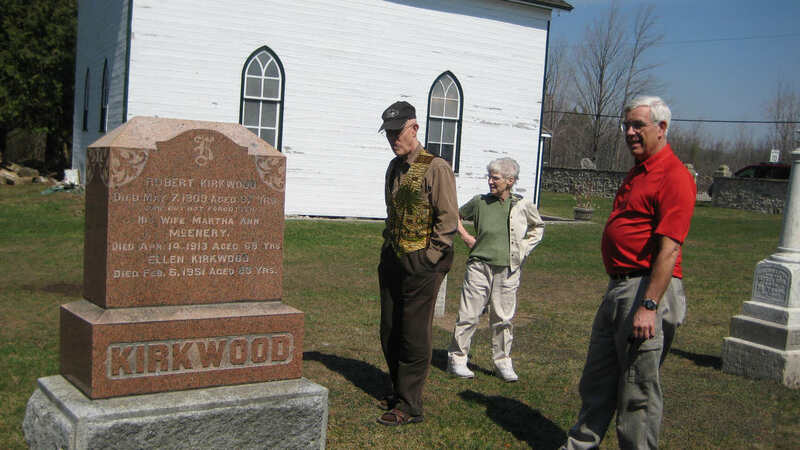 lan Kirkwood, whom you have already met also confirmed the connection between the Rockside Kirkwood and the McKay’s. 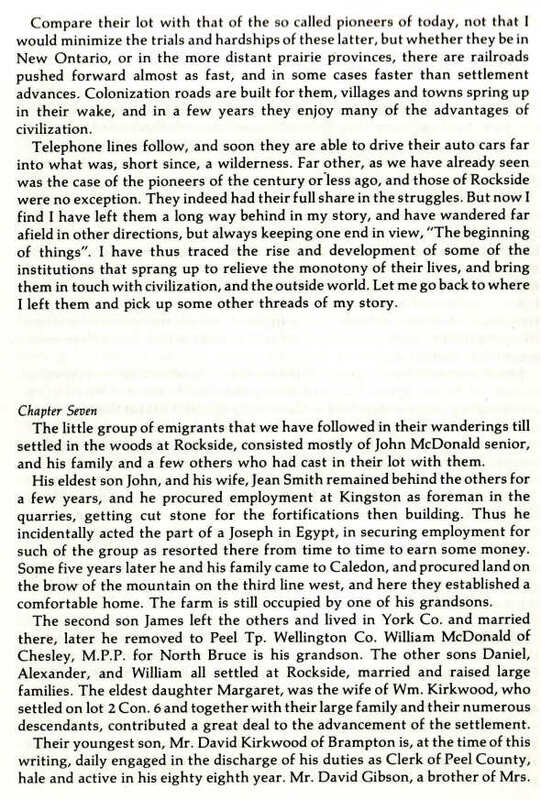 Alan has over 18,000 persons documented in his extensive research on the Rockside pioneers and their descendants. He is the source of most documents and the information we share with you. It is amateur and very talented staticians, genealogists, historians and storytellers like he, Joan Kadoke, Alan and Nancy Sinclair, Ada Kirkwood, Wilma Sinclair and many others who ensure that the past is not forgotten,. Without their dedication and the work of the various Women’s Institutes as recorded in the Tweedsmuir Histories, all this working class history would be lost. The story of William Kirkwood, the first Scot of his clan to come to Rockside, follows. KIRKWOOD, William (d.), was b. at Castle Semple estate, near Howood, Renfrewshire, Scot., and d. in 1850, age 56. William Kirkwood, Freeholder of Howood, Scot., sailed for Canada on Young Norval in 1820, and was eight weeks crossing. He left his family in Toronto, and, with his son John, pushed west in search of land. He located on lot 2, con 6, Caledon Tp., on the town line of Erin, where he put up a shanty, and the following year moved up his family from Toronto. They were obliged to walk most of the way, as the bush was impassable for teams. They crossed the Credit River on a log. At the time of his death at the comparatively early age of 56, he had a most comfortable home. He was a Presbyterian, and a Liberal. He m. Margaret McDonald in Scotland. Issue: John, Mrs. Wm. Beer, Erin Tp. ; William (d.) and James (twins), Erin Tp. ; David, Brampton, Co, Clerk, Peel Co.; Mrs. Daniel Douglas, Norval, and Mrs. George Thompson (d.), Toronto; Mrs. Creighton (d.), Mrs. Trout, (d.); Mrs. McLachlan (d.), and Mrs. A. Near (d.). John b. in Howood Scot., 1808; d. 1880, age 72. He worked in the cotton mills for about three years before he came to Canada with his parents in 1820. He helped his father to put up the shanty on his place before the family were brought up from Toronto. 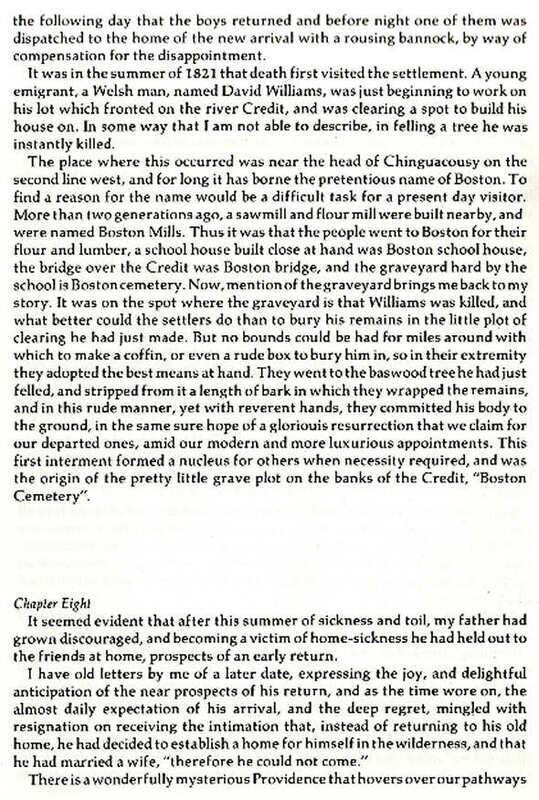 In 1832 he bought 50 acres of lot 1, con. 6, Caledon and later the remaining 50 acres and finished clearing them. He was a good business man, and brought the first cylinder separator into the district, where he operated it for years, and at his father's death he retained the homestead. He was Township Councillor and Deputy Reeve for years of Caledon Tp., and served as Deputy Reeve in the old Home District Council. About 1856 he was appointed a Magistrate, and at Confederation, Mr. Kirkwood and Isaac Harris, of Caledon, were the first to be re-appointed, so that oaths, etc., could be administered. He was one of the workers in the Liberal party, and was active in the support of the Presbyterian church. He m. Margaret, dau. of Alex. Patullo of Caledon, who d. in 1898, age 84. Issue: William (d.), Brampton; Mrs. T. H. Lee (d.), Vancouver; Alexander (d.), and Mrs. James Buckham (d.), Chinguacousy; Mrs. George Sharp, and James, Caledon; John and Mrs. Charles Overland, Erin. John, Jr., b. Caledon in 1849, and went to school to the Rev. Dr. Fletcher, of Hamilton, who was a school teacher of No. 1 Erin. He operated the farm some years before his father's death, when he succeeded to the homestead, where he now resides in a large stone house, one of the finest homes in the section. He also owns 100 acres the east half, lot 3, con. 11, Erin. He has a local reputation as a breeder of Polled Angus cattle, keeping both thoroughbred and graded cattle, which he raises for his own satisfaction, as he likes good stock of all kinds. He is a widely read man, and keeps up with all current events. For about thirty years he has been Postmaster at Rockside. He has been an active worker in the Liberal party, being on local committees at different times. In religion he is a Presbyterian. He m. Alice, dau. of James Sharp of Caledon. Surviving issue: Bessie L. and George S.
James, son of the late William Kirkwood, was b. Scotland in 1817, and d. in 1853, age 36. He set. 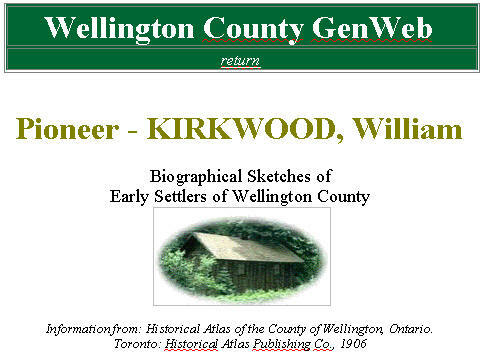 in Erin in 1840, on the 100 acres lot 4, con. 7. He was an ardent sympathizer with Mackenzie in his troubles against the Family Compact. Like all of the Kirkwoods, he was a Liberal. He d. of sunstroke at the early age of 36, just as he had gained a good start in life. In 1840 he m. Agnes Davidson. Issue: William and John, U.S.; James, David, Thomas, Ann J.(d. ), and Mrs. D. McGregor, Caledon. James was b. in Erin in 1845. He has been a leading man in the township for years. He was a Councillor for twelve years, commencing in 1870, being successively Councillor, Deputy Reeve, for five years and Reeve three years. In 1891 he was elected M.P.P. for East Wellington, and was in the House for three years. In 1902 he was appointed Police Magistrate for the unorganized district of East Nipissing, which position he held for three years, until removed by the present Whitney Government. He was Sec'y. of Erin Agr. Society, and Sec'y of East Wellington Farmer's Institute for some years. He is noted as a man of pronounced opinions in temperance questions and is a total abstainer He is an Elder of the Presbyterian church n and in politics a Liberal. In 1871 he m. Agnes McDonald. Issue: Annie, Mrs. F. Brydon, Erin; Violet, Alexander, teller in Traders Bank, Rockwood, and Herbert. 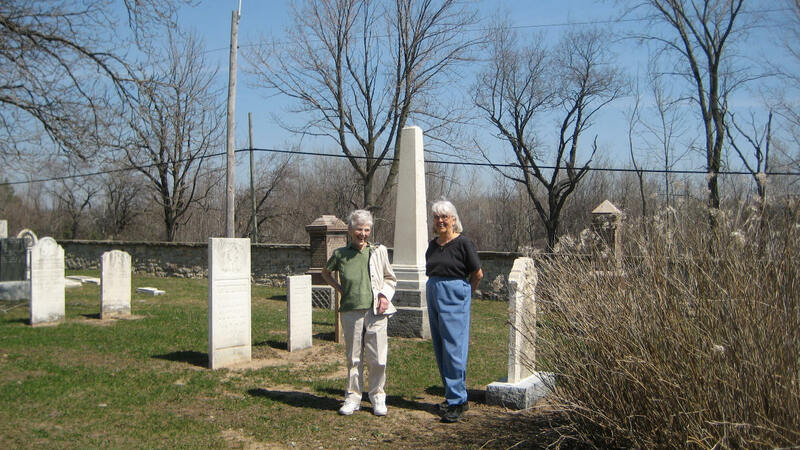 The White Church and cemetery were saved and preserved by local heritage volunteers from Belfountain working with the City Council of Erin. The group is now known as the Belfountain Heritage Society. 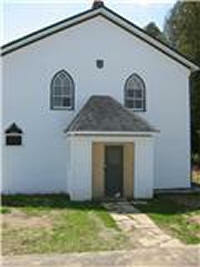 Built in 1837, the Melville White Church is the oldest standing church in the Town of Caledon. It represents the communal efforts of the "Rockside Pioneers", a group of Presbyterian Scots who settled in the area in the early 1820's. 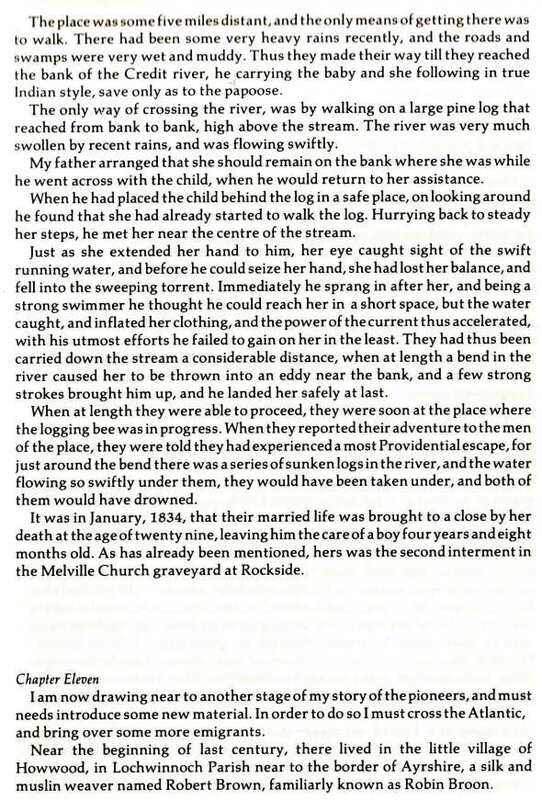 Organized by Rockside Pioneers John MacDonald and John Crichton, this early congregation first met in MacDonald's home. 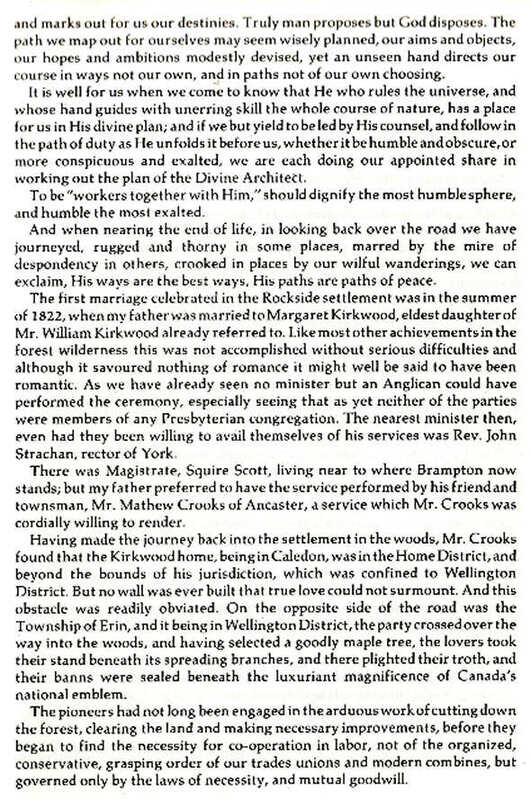 By 1828, John Crichton had secured the services of Reverend Andrew Bell, who walked 25 miles once a month to preside over a weekday service. Bell established the congregation of "West Caledon" in 1831; one of its earliest ministers, Duncan McMillan, preached in both Gaelic and English. The original church was a log structure that also served as a school, and was located across the road from the present church. Built by the Daniel McMillan & Bros. of Erin, the church was painted white upon completion and quickly became known as "the White Church". The origin of the name "Melville" remains a mystery. In 1843, the Caledon Presbyterian congregation joined others in Upper Canada in separating from the established Church of Scotland and forming the Free Church of Canada. Land for the adjacent cemetery was deeded to the church in 1866. Some of the names of those early worshippers who enriched the history of the White Church are: Crichton, Gibson, Frank, Pattulo, Burnet, Kirkwood, Foster, Hunter, McLachlan, MacMillan, McEachern, Campbell and Sharp. Many of these pioneers came from the Isle off the coast of Scotland. A small church up the road disbanded in 1990 and, although Congregationalsits, swelled the ranks of the "White Churchers". Greenlaw Corners no longer exists, but the remnants of their cemetery can still be seen at the corner of Mississauga Road and The Grange Sideroad. Throughout its history, the White Church has had wonderfully colourful ministers. 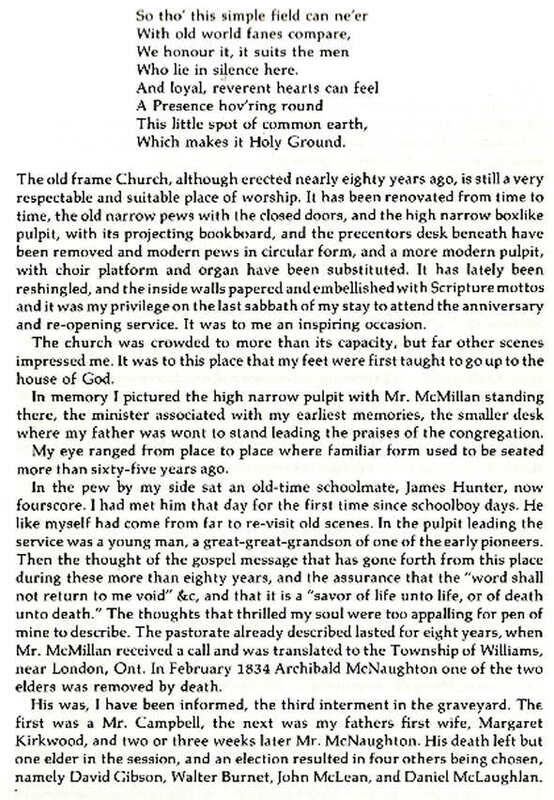 McMillan often preached in Gaelic. 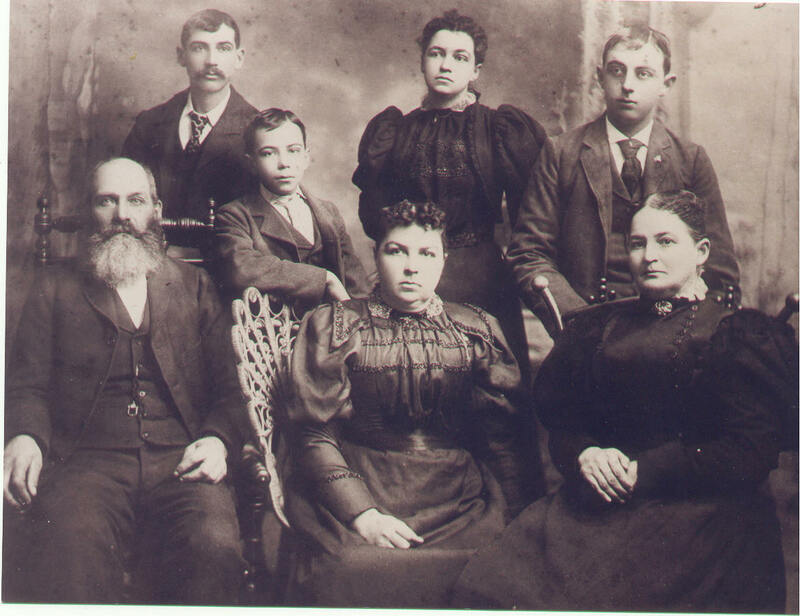 There was an Irishman, a Mulatto (1857) and a blind Syrian (1886). Multiculturalism was alive and well in those days! The White Church's congregation ebbed after its centennial in 1937 and the congregation eventually disbanded in 1964. 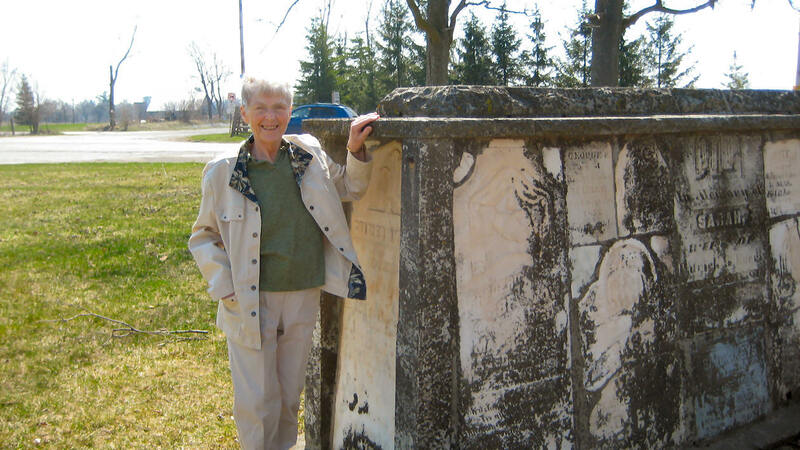 In 1966, the Credit Valley Conservation Authority purchased the church and cemetery property. Most of the church furnishings were sold, although the pulpit was later re-purchased and other artefacts have been returned. Now owned by the Town of Caledon, the church is being restored by the Belfountain Heritage Society for use as a public venue. Thanks to the tremendous efforts of the BHS and strong community support, this important historical landmark has been given a new lease on life! The stone wall with the iron gate was erected across the front of the property in 1901 and 1902; at the same time a system of drains was installed across the cemetery. The adjacent cemetery is the largest in the immediate area and contains the headstones of many of the Rockside Pioneer families. Architectural technologist Denis Heroux, through the Architectural Conservancy of Ontario, prepared a stimulating and positive report and plan for the restoration of the White Church. He concluded: "The White Church, one of the few remaining pre-Victorian era timber fame churches in Ontario, is a valuable cultural resource to the Town of Caledon. The modest size of the church, the quality of the natural light filtering through the windows, and the simplicity of the decor made the building highly adaptable for a number of users. It is also fortunate that the church is built mostly of wood making it possible to use local skills and materials." The fact that the White Church is a heritage building is not an obstacle to its reuse. The building can be easily modernized while retaining its heritage character. This report recommended two restoration options - the first for year around use, and the second, only for summertime. This latter option is the plan the Belfountain Heritage Society has undertaken. We return soon with more on the Kirkwood’s.